This is one of a series of Q&A articles with East Kingdom Officers. The Gazette thanks Master Ryan Mac Whyte, Brigantia Principal Herald of the Kingdom of the East, for answering our questions. The responsibilities of the Brigantia Herald’s office are many and varied but the functions can be broken into three broad areas. The First is the most visible, that of Court Heraldry. Through the Eastern Crown deputy’s office we organize and perform the ceremonial portions of our events. The Brigantia and Eastern Crown deputy work together on a week to week basis on arranging for court and organizing the scrolls on the day of the event and work together with the Shepherd’s Crook Herald to maintain the records of awards in what is called the Order of Precedence. The intricate dance which is Court takes a good portion of every day’s time for the Royalty and the Court Heralds. Most of the time ‘Court’ for the Heralds begins first thing in the morning when they get on site. The Second broad category which the Herald’s office is broken into is Field Heraldry. Field heraldry includes calling for combatants to enter the lists during a tournament, crying announcements to the event site, and otherwise being Loud. 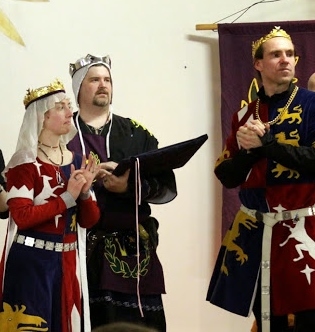 The Troubadour Herald’s office arranges for the organization of heralds for Crown Tournament, K&Q Champions of Fencing, and K&Q Champions of Arms. Being a Field Herald is all about grabbing the attention of distracted people across the fields of a list and managing another dance between the heralds and the Ministers of the Lists and the Marshals in order to keep the tournament moving. There are several deputy heralds who assist the troubadour with the display of heraldry during the tournaments. The third category of the Heralds’ office is the least visible, but the most intricate and arguably the most important. Book heraldry is broken into Armorial Heraldry, which concerns the regulation and development of coats of Arms, and Onomastics, which is the research of Names. Onomastics and Armory combine to give us a sense of who we are, and who we want to have been in the times we are recreating. They are the basis of our personae and there is a virtual mountain of research which has been done over the last 50 years. Book heralds are not only those who sit in consulting tables on the weekends and assist our members in designing heraldry and selecting names, but also those who during the week, in their spare time, research and document and confirm the authenticity of our heraldry and names. Book Heraldry is led by the Blue Tyger Herald and staff. As Brigantia I manage the personnel who fall into these areas and ensure that the College of Heralds of the East continues to perform at its best. The Eastern College has been the leader of the Known World in heraldic research and heraldic performance for years and I can only hope that my leadership and management continue that tradition. I initially got involved with the College of Heralds when a friend of mine, Rowen Cloteworthy, noticed I could be REALLY loud on the archery range. He saw me at a Crown Tournament and he gave me, and my lady wife Kayleigh, the opportunity to cry the lists. I was hooked instantly. Within three years I had become the Troubadour Herald, in charge of running Crown Tournament’s Heralds. As a heavy fighter myself I really enjoyed having a front-row seat to watch the fights. Being able to watch the best fighters in the known world from close range is an amazing thing. Soon after I began my foray into field heraldry I was introduced to Court Heraldry by Malcolm Bowman. He coached me through court procedures and, along with Alys Mackyntoich trained me in the finer points of running a Court. Again Rowen coached me and set a fine example for me to follow for running Coronations. But the greatest thing in enjoy about Court Heraldry, and the real reason I keep doing it, is being able to see the look on a recipient’s face when they get an Award. There is no greater joy in the SCA than seeing a person’s face light up when it happens. I have long had a fascination with Armory. My family can trace its bloodline, on the fraternal side, back to the 1600s when they left Southern France for Canada. When I was little I used to enjoy seeing the Armory in the family tree, from back in history when it was recorded. When I began in the society I designed my own arms and immediately became fascinated with the rules and with the design elements. I’ve been hooked ever since. My primary goals for my term were to get all the Kingdom’s awards registered, which is finally finished, and to get the Kingdom’s Order of Precedence repaired. The Challenges in both are many but, with one problem down, the Order of Precedence is going to take center stage this year. I can only hope I leave the College stronger than I found it. My first event was Jack Frost Bite Me II. An informal archery event held in the dead of winter. It had to be 10 below zero, with blowing, biting wind held at a member’s home in the Barony Beyond the Mountain. I was brought by my long-time friend, new, at the time, girlfriend, and now, years later, wife Kayleigh Mac Whyte. She had joined the SCA the summer before and had brought me along on a date. A month later I had purchased my own bow and arrows, and a month after that I was a SCA member. I can say that it’s she who kept me in the SCA but it was really the community which we share in the SCA which keeps me coming back. I can not possibly do justice to a list on this topic because there have been so many. I’d have to say the first person to make an impact on me was Ragnar Two-Axe of the Reeking Swamp for being my mentor in archery and for teaching me that this IS a game and the first rule is to have fun. I’d have to say Duke Andreas von Ulm for being an example of chivalry and leadership to which i still strive to match. I’d have to say Duchess Anna of Tarragon for showing, by her example, how to still have fun with this game after all these years and for sharing with me her boundless energy and enthusiasm for the SCA. And lastly I’d have to say my Protegees, Raffaella, Donovan, Brighid, and Anastasia. Their faith in me inspires me to be better than I ever thought I could be.